Super-slick operators Team 1 have returned home after a hugely successful trip. As previously mentioned, the team consisted of Dr Peter Shakes, returning for the second time; equipment guru, Keith Mentiplay, on his 4th trip to TL; newcomers Patrick Fitzgerald and Sally Stephens, and their team leader, the ever-cool Dr David Sheen. This team had the additional responsibility of sifting through the equipment and materials that we sent over earlier this year, determining which equipment was to stay in Railaco and transporting the rest to Maubara. After accomplishing this task on Day 1, the team spent week 1 in the Maubara and Loes districts with our indefatigable boss, Sr Filomena. They treated patients in the villages of Fau Lara, Trans and Guiço, as well as seeing the kids from Maubara Orphanage at the fixed clinic. As usual, the team was confronted by equipment issues – a flat battery in T2, misbehaving generators and a troublesome compressor. 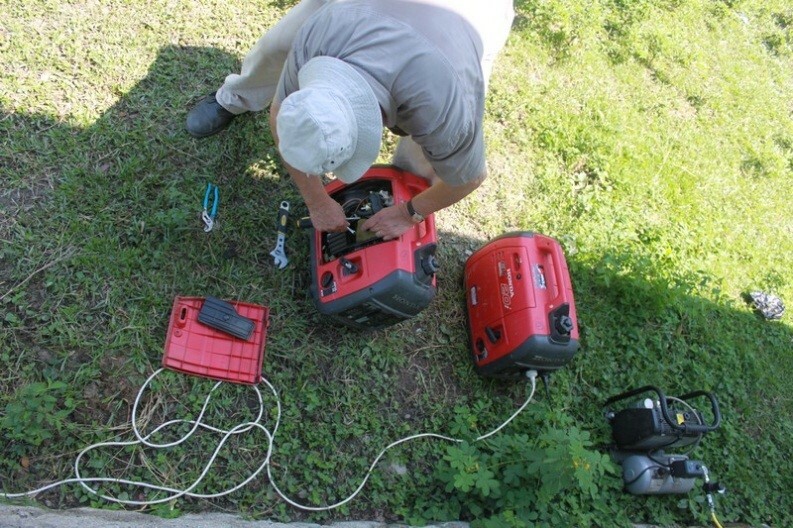 Luckily for this team, they had a not-so-secret weapon – Keith – who spent all hours day and night fixing and upgrading our equipment, as well as installing the new chair and compressor in Railaco and fixing equipment issues in our Lions partner’s Klinik Pas. 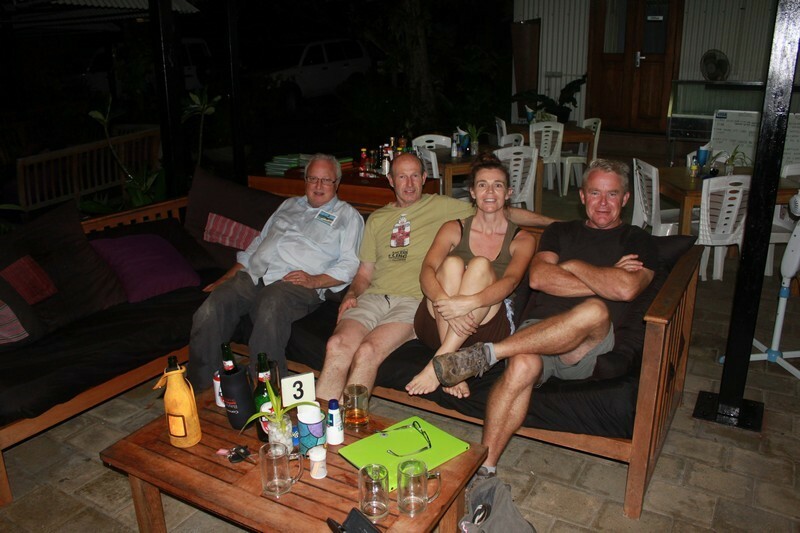 He did a lot of travelling – Keith had a hectic 6 days before leaving TL at the end of Week 1. He probably needed a holiday! Thanks Keith! 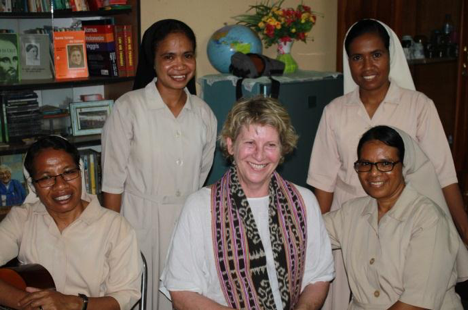 The following week, Sr Filomena handed the team over to the Jesuit crew in the Railaco. Lucky Team 1 had the opportunity to enjoy the unparalleled hospitality of the enthusiastic Fathers Bong, Bert and Phuong, Sr Rita, and the company of a chorus of others, including the high school principal, Michael, and a visiting Aussie nurse, Jenny. 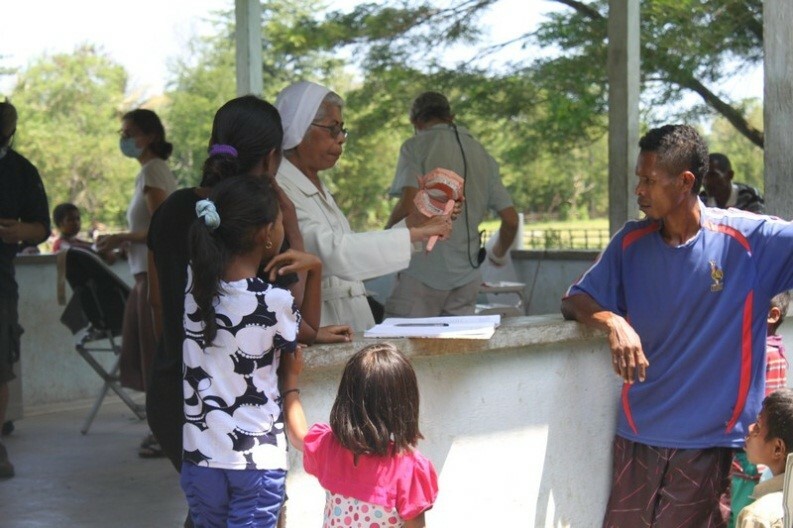 The team treated patients in Railaco Leten, Railaco vila, Cocoa vila and Gleno. This area has beautiful scenery and the temperate weather is a welcome relief from the sweltering coast. They were fortunate to have the help of friendly English-speaking locals, Victor and Noberto, who provided assistance with communication. 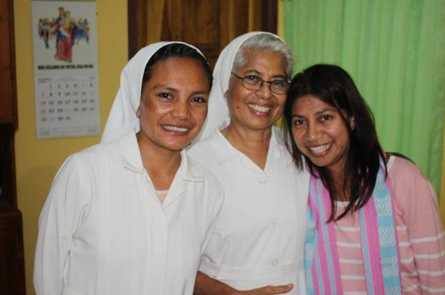 To the team’s disappointment, both Aida and Tino – the Timorese dental therapists whom we mentor – both had to attend a Dept of Health inservice for almost the entire time the team was in TL. Fortuitously, Tino (who is stationed at Ermera) returned to base on the team’s penultimate day and everyone had the opportunity to work together. We first met Tino in Liquiça and is great to hear that he is still as dedicated and enthusiastic in helping his community as ever. According to reports, this team never lacked for enthusiasm or the will to do some hard graft. 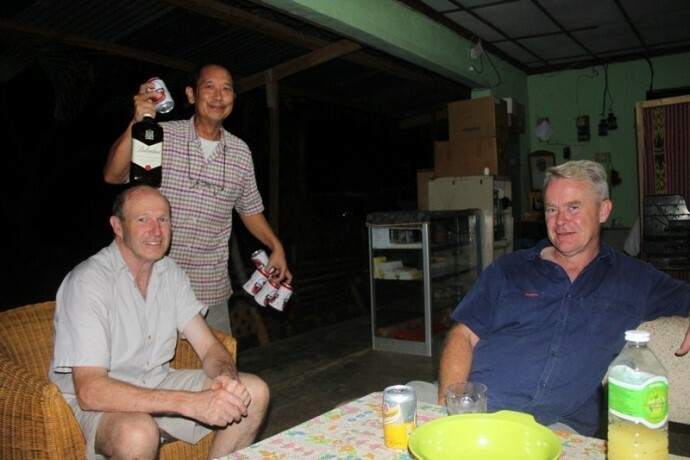 Patrick, a builder by trade, proved he was a truly multi-talented individual, becoming an excellent dental assistant, sterilisation expert and roadie overnight, while entertaining the team with his Irish humour. Sally proved to be one of those dental assistants that we dentists refer to as Supernurses – able to handle anything and everything with good humour and ease. She kindly made her car available for the team’s use during the trip. Thanks Sally! Also,she is so enthusiastic that she has already volunteered to work with the next couple of teams as well as to do their inventories and sort out the clinic once they depart. We may have to decline or be spoilt forever. Peter Shakes (the quiet achiever and smooth operator, who gets the job done) and Sally were the ‘Dream team’, doing the bulk of the clinical work. All up, the team saw over 356 patients. They extracted 305 teeth, and despite the breakdown of our remaining slow speed handpieces, restored 127 teeth and carried out 47 preventative treatments. Thanks to David, Peter, Sally, Keith and Patrick for all your hard work and adaptability. Your humble and helpful natures contribute to the building of peace and trust in TL. 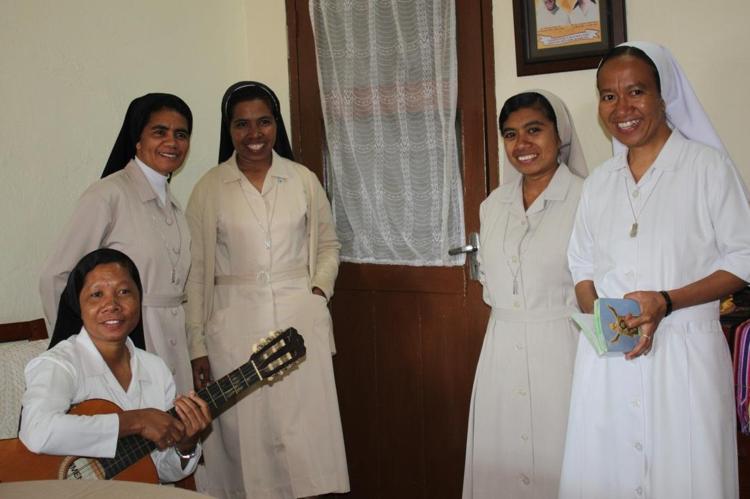 Thanks also to Sr Filomena, Father Bong, Tino and all the other Jesuits and Carmelites whose dedication and patience continues to make this program possible. 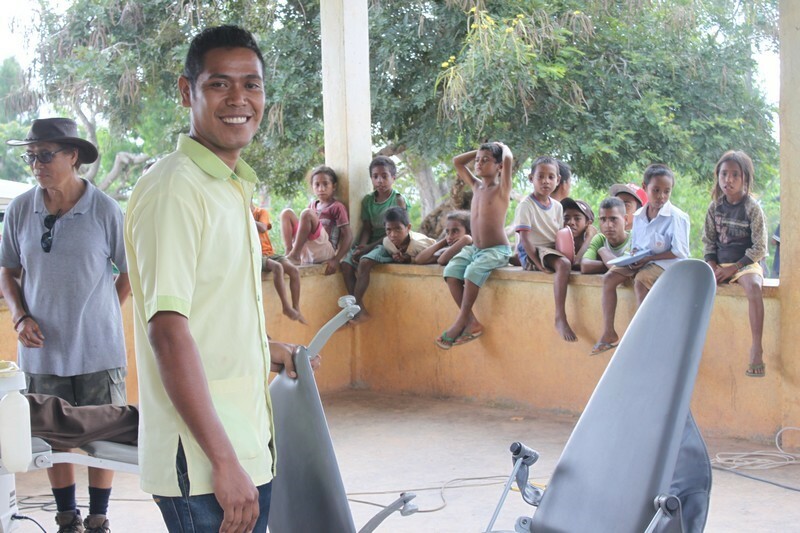 Lastly, thankyou to Henry Schein Halas for continuing to support our program with much needed materials and equipment, which allows us to continue to help the East Timorese people. Last Thursday, vital supplies for the Timor Leste Dental Program were delivered to Rotary’s Donation in Kind warehouse in West Footscray, Victoria, where in two weeks, they will be placed in a shipping container bound for TL (via Hong Kong!!?) – an unwieldy way to get goods across to a country that remains without a postal system. Many, many thanks go to Ben Sheen, who drove the supplies from Sydney to Melbourne. Amongst these supplies are an electric dental chair, bound for Railaco, a portable suction unit, a dental drills cart and lots of consumables! Many thanks to the amazing Keith Mentiplay for checking out the chair, to fabulous John O’Connor for overhauling the dental cart, to Dr Gordon Howe for donating the suction unit and to Dentsply for the consumables. Special thanks to Henry Schein Halas for the 15 cartons of gloves, bibs, and masks etc- the Henry Schein Cares team really came through for us at short notice. Thank you Jessica and Kira! I know that our dental teams will truly appreciate NOT having to carry all this stuff to TL this year! 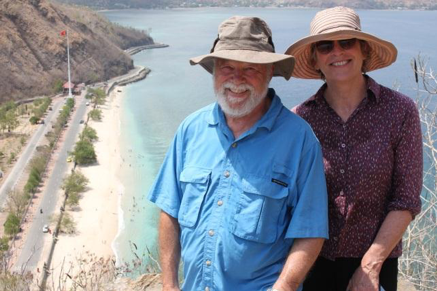 Our gear should arrive in Dili by March 22, where it will be taken in hand by our hardworking Rotary Liaison Officer, Daryl Mills, who seems to effortlessly, and tirelessly, juggle all the needs of all the Rotary Programs in Timor Leste. Daryl will distribute the gear – just in time for the first team which arrives in April! Thanks Daryl! 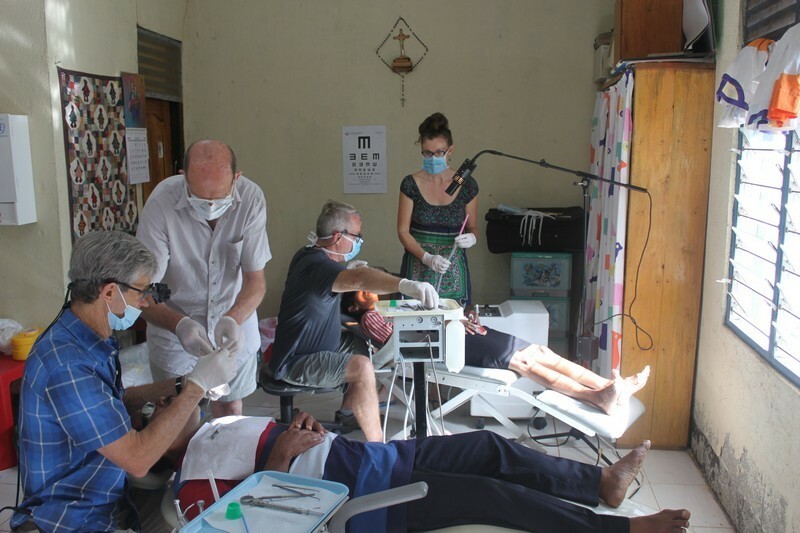 Like all volunteer programs, the Timor Leste Dental Program exists because of the efforts of a multitude of dedicated, generous, caring people. We are grateful for you all.